Some functions do not have any arguments. Some functions have a fixed number of required arguments (from 1 to 60). Some functions have a combination of required and optional arguments. The following sections demonstrate how to use arguments effectively with functions. I didn’t cover optional arguments in this article. Though most VBA functions use arguments, that’s not a requirement. Excel has some predefined functions that don’t use any arguments, such as RAND(), TODAY(), and NOW(). RAND(), TODAY(), and NOW() functions don’t use any arguments. Choose File ➪ Options ➪ General to see this section. The following is a simple example of a custom function that has no arguments. This function returns the UserName property of the Application object. This name appears in the Personalize your copy of Microsoft Office section of the Excel Options dialog box. This function is very simple, but it is the only way you can get the username to use in a worksheet cell or formula. When you use a function with no arguments, you must include a set of empty parentheses. The expression represents a Speech object. Though Speak() method can take three arguments, but Text argument is the required one, the rest are optional. I shall use the Speak() function by passing only Text argument. So, for this case, it is a function with one argument. This method uses Excel text-to-speech generator to “speak” the text passed to it through Text argument. Note: To hear the voice, your system must be set up to play sound. You can use this function in a slightly more complex formula, as shown below. In this example, the argument is a text string (“Good achievement”) rather than a cell reference. The above formula calculates the sum of the values in Column A. When that sum exceeds 1,000, you will hear “Good achievement”. When you use the SpeakTheText function in a worksheet formula, the function always returns 0, because this function is returning nothing. In other words, I can say, there is no value assigned to the function’s name (SpeakTheText) variable. Okay, now I’m going to deal with a more complex function. This function is designed for a sales manager who calculates monthly commission that he has to pay to his salespersons. To boost up the sales of the company, the commission rate structure is based on the amount sold— those who will sell more will earn a higher commission rate. You can use more than one method to calculate commissions for various sales amounts. Commission calculated by if function. Firstly, the formula is undoubtedly complex and not easy to understand. Secondly, the commission rates are hard-coded into the formula. If the commission structure changes in future, it would be tough and toilsome to modify the formula. A simple and better solution is using a VLOOKUP table. I have entered the data of the above table (Monthly Sales Target & Commission Rates) in cell range G8: H11. Click this link to know about VLOOKUP function, if you don’t know. 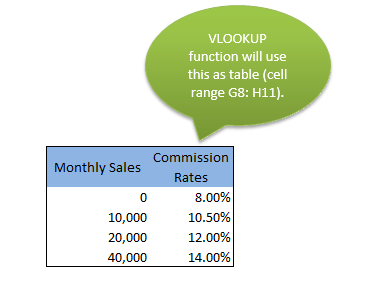 VLOOKUP table for the data that calculates the commission rates for sales target. Note: It is important to note that I have used 0 for the data range 0-9999, 10,000 for 10,000-19,999, 20,0000 for 20,000-39,999 and 40,000 for 40,000+. When I do so, Excel searches data < 10,000 in 0 row, 10,000 ≤ data ≤ 19,999 in 10,000 row, 20,000 ≤ data ≤ 39,999 in row 20,000 and data ≥ 40,000 in row 40,000. 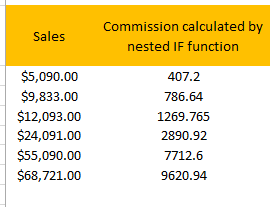 Use this function in other cells to calculate the sales commission earned by the sales force. 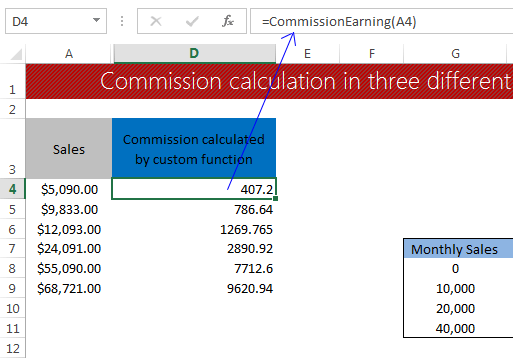 Commission calculated by VLOOKUP table. Like the following one, you can create a custom function to calculate the commission earning by the sales force. Commission calculated by the custom function. 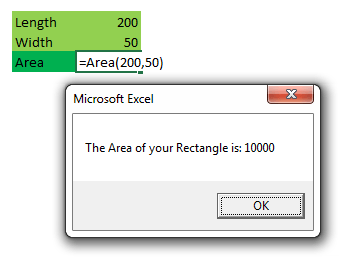 In this example, I am going to write a VBA function that will calculate the area of a rectangle. We know the area of a rectangle= Length ☓ Width. 'Finding out the Area of the Rectangle. 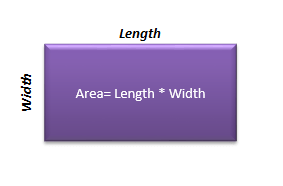 This function takes two arguments(Length and Width) from the user and shows the area of the rectangle in a message box. Showing area of a rectangle in a message box. Well, the last type of argument is the range. It is demonstrated here. The above formula will return the average of the largest 5 values of your data. The formula works fine, but you will face a problem when in next time your boss will ask you to average of 100 values from a data range of say 2000 values. This time you have to rewrite this formula in a new way and it is really toilsome. 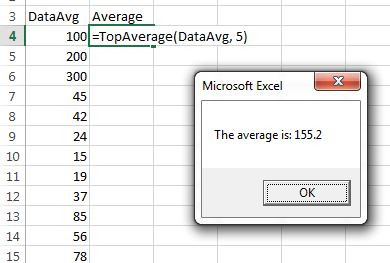 Here comes the custom VBA function, TopAverage (DatAvg, Num). Average is showed in a message box. 'Large(Data, i) returns the ith largest value from the Data. This situation is an example of how a custom function can make things easier for you. This function takes two arguments: DataAvg and Num. DataAvg represents the range of data that you’re working with. Num is the number of largest values you want to average from the data range. The code initializes the Sum variable to 0. Then it uses For- Next loop to calculate the sum of the Num number largest values. Notice that I have used the built-in LARGE function of Excel in the code. You can use any worksheet function in the custom VBA function using WorksheetFunction and a period before the function name (WorksheetFunction.LARGE). Finally, the average is found just dividing the Sum by the Num (Sum/Num). I showed the result in a message box with this text: “The average is: “.